Home » Restoration or Romanticism fashion era. Importation of foreign fashions in 1815. Anglomania in 1815. Green gauze veils; spencers. The “canezou”. Lacroix, the stay-maker. Dr. Pelletan and Charles X.
Fashions “a l’Ipsiboé,” “au Trocadéro,” and “à la Dame Blanche”. Fashions “à la giraffe;” “the last sigh of Jocko”. Importation of foreign fashions in 1815 — White dresses, white feathers, and fleurs de lys — Emigrant ladies — Russian toques — Male and female dressmakers — Ruchings — Short sleeves and long gloves — Herbault’s bonnets — “Chefs” — Anglomania in 1815 — Green gauze veils; spencers — The “canezou”— Lacroix, the stay-maker — Dr. Pelletan and Charles X. — Wasps — The “Ourika” fashions — The famous leg-of-mutton sleeves — Fashions “a l’Ipsiboé,” “au Trocadéro,” and “à la Dame Blanche” — Blonde caps and turbans — Head-dresses — Fashions “à la giraffe;” “the last sigh of Jocko” — Female book-keepers; shopwomen — The Cafe des Mille-Colonnes. The lamentable presence of the allied armies in our capital induced us to adopt some fashions from abroad. Our countrywomen copied certain details of dress from the Germans, the Poles, the Russians, and the English. They professed to “find good in everythinor,” quite forgetting the claims of patriotism. 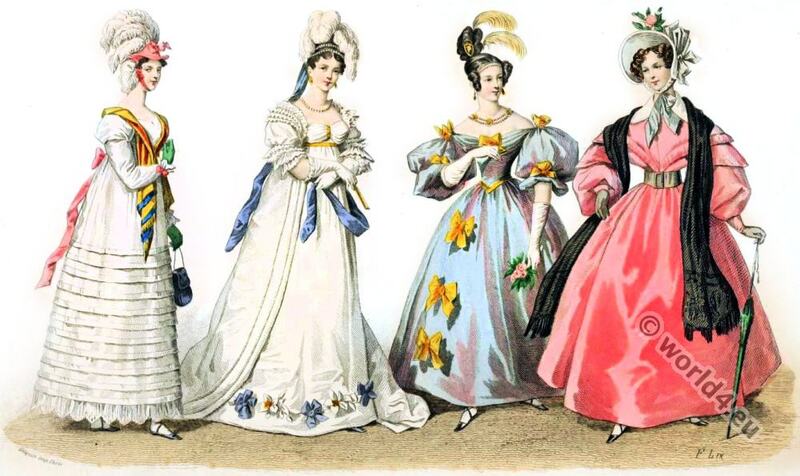 The noble ladies who returned from emigration in 1815 could not reconcile themselves to the fashions of new France, and the shape of gowns and hats became almost an affair of state. The Legitimists, when once they had recrossed the frontier, endeavoured to repudiate whatever could remind them, nearly or remotely, of the Republic and the Empire. 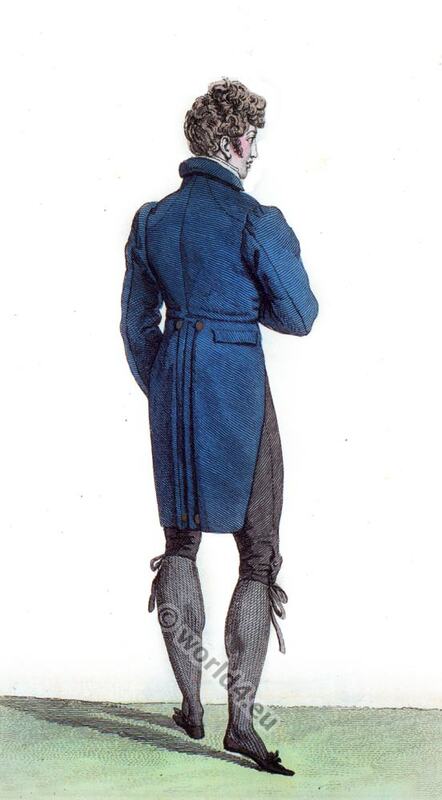 The fashions of 1815 were, generally speaking, influenced by the changes effected by the Restoration in France. The white flag floated from the dome of the Tuileries, and there was a passion for white gowns; while feathers of the same hue waved on the heads of women, in honor, no doubt, of the heroic white plumes that Henri IV. “bore along the path of honour.” More than one great lady at the court of Louis XVIII. trimmed the edge of her skirt with a wreath of lilies, while she altered but little the shape of her gown, which remained as short waisted as under Napoleon I.
Russian toques. Male and female dressmakers. In the early part of January, 1816, a wealthy foreigner appeared at the opera wearing a Russian toque. She created quite a sensation; and the next day a first-rate milliner of the Rue Vivienne had reproduced the head-dress, which soon afterwards was universally worn. There was a general craving for splendid dress. Enthusiastic Royalists gathered round Louis XVIII. and the Comte d’Artois, and thronged the apartments of the Tuileries. Nothing was thought of in the Faubourg St. Germain but balls, concerts, and entertainments. Costume Parisien 1816. Habit à Collet de Velours. Gilet de piqué. 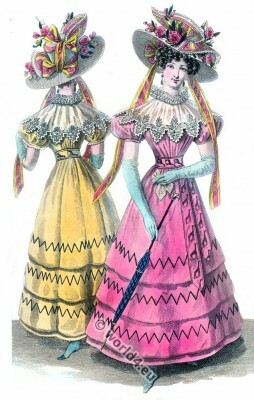 Costume Parisien 1816. Chapeau de Reps, par-dessus de Lévantine. 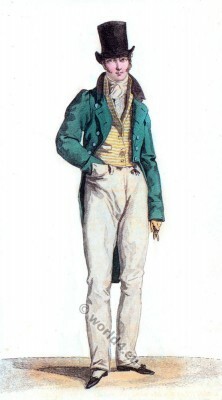 Costume Parisien 1816. 1, Chapeau de Gros de Naples. 2, Chapeau de Tulle. 3, Chapeau de Reps à fond de Tulle. 4, Cornette de Tulle. 5, Cornette de gros de Naples à fond de Crêpe. A great revival took place in trade, and served as the general excuse for extravagance. In a very short time Paris possessed four renowned ladies’ tailors, thirteen milliners in large practice, seven noted florists, three favourite stay-makers, eight famous dressmakers, and eight excellent ladies’ shoemakers. White gowns, trimmed at the bottom with flowers, were generally worn both at official and private balls. Flowers, roses for the most part, were worn in the hair. Plaid dresses were in fashion, dresses “à l’indolente,” and dresses trimmed with chinchilla. Dresses were made in various styles. Sometimes sleeves were short and puffed, and trimmed with several rows of ruching; and sometimes they were funnel-shaped, that is, there was a certain amount of fulness at the shoulder which gradually diminished as they reached the wrist, where they were hermetically closed by a ribbon over a coloured kid glove. Dresses were cut “low,” and necklaces of pearls or garnets were worn. When the sleeves were short, long gloves concealed the arm, and the effect was very pretty. Embroidered “toques” were also in faishion, ornamented with pearls and a wreath of marabout feathers. Long gloves were expensive; but no well-dressed woman hesitated to put on a new pair every day, a soiled glove not being admissible. Tan was a favorite color. Valuable jewels, wide bright-colored sashes, delicate fans, and embroidered or braided reticules completed the attire, and gave it character as well as intrinsic worth. Married women wore little half-handkerchiefs tied round the throat, and young girls wore apron-dresses (tablier-robes) entirely in white. The hair was arranged in little curls close round the forehead and temples, and in small rolls at the back of the head. Artificial flowers were used, but sparingly. 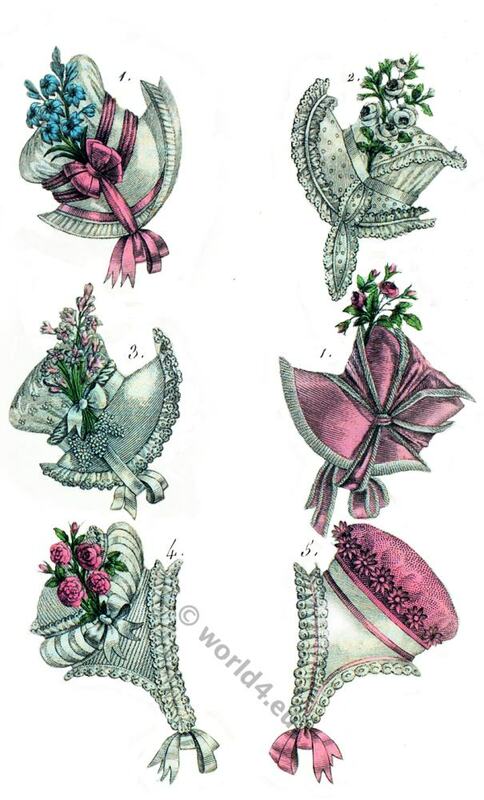 Bonnets were made without curtains, and were worn rather tilted forward over the face, so as to display the chignon and neck; they were trimmed with artificial flowers. Large chip hats and white feathers were purchased at Herbault’s, who also sold small white satin ones, the brims of which were cut into points or squares, and surmounted with marabouts. Other milliners manufactured “cornettes” in black velvet, edged with white tulle; they even placed black hats on white “cornettes.” Many dresses were made of fine white merino, with wide stripes of dead silver, called “chefs.” White merino boots, laced at the side, completed the costume. 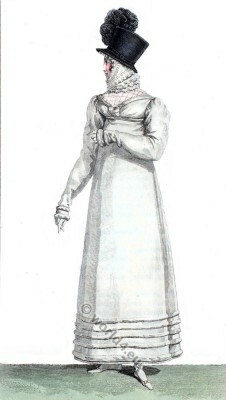 Costume Parisien 1816. Habit de Drap. Culote de Soie. Bas à Mailles coulées. Costume Parisien 1816. Chapeau de Velours sur une Cornette de Culle. Robe de Mérenines. During the first few years of the Restoration our fair countrywomen indulged in various successive caprices. The “Journal des Modes” from 1814 to 1815 holds up the most extraordinary fashions to our admiration. Women, moreover, were seized with Anglomania. A caricature of the time represents “Mme. Grognard” trying to force her daughter to dress herself “a l’Anglaise.” The young girl replies,— “Gracious! how frightful! What dreadful taste! To think of wearing English fashions!” But, criticism notwithstanding, ladies adopted the English custom of straw bonnets and green gauze veils. They wore spencers, a garment resembling a jacket with the skirts cut off a little below the waist. These were generally made of velvet, reps, or satin, and in every color. They wrapped themselves in green kerseymere cloaks with double collars, in merino coats, and in silk “douillettes,” or wadded gowns. But imperceptibly, and because good taste never altogether cedes its rights, puffings and heavy trimmings were discarded, and the “canezou,” a sort of sleeveless bodice, superseded the spencer. Muslin canezous were becoming to most women, setting off the figure of both young and old. Unfortunately Frenchwomen soon returned to the ungraceful leg-of-mutton sleeves, and sleeves “à beret,” “à la folk,” “à l’imbecile,” and “à l’elephant.” Every day brought forth some new thing, of more or less wonderful shape. Cambric chemises were beautifully embroidered and trimmed with narrow Valenciennes round the neck and sleeves. An embroidered jaconet gown cost as much as 900 francs. And this did not discourage, but, indeed, promoted prodigality in the purchase of stockings and pocket-handkerchiefs. For full-dress mourning, black “toques” were worn, embroidered in bronzed steel with a plume of black feathers, and black gowns were similarly embroidered. Stays were costly, and remained in fashion. Those of Lacroix, a very good maker, cost one hundred francs; they were made in two pieces, and a small cushion covered with white silk was fastened on behind to give elegance to the shape (The familiar “bustle,” of course). In 1824, the Duchesse de Duras brought out her romance, “Ourika,” which was already known and admired at court, at the Royal Printing House, as if it were a scientific work. It was received with rapture by the general public, and was spoken of as the “Atala of the Salons.” There were “Ourika” bonnets, caps, and gowns, Ourika shawls, and a color called Ourika. This sort of passing enthusiasm recurred very frequently; and no sooner had a book or a circumstance obtained the notice of the public, than it received consecration, as it were, from the fashionable world. From 1822 to 1830 the following colors were in fashion: “Ipsiboé,” “Trocadéro,” “bronze,” “smoke,” “Nilewater,” “solitary,” “reed,” “mignonette-seed,” “amorous toad,” “frightened mouse,” “spider meditating crime,” &c.
The eighteenth century seemed to have come back, in the matter of designations at any rate. A paroxysm of splendid extravagance was occasioned by the coronation of Charles X. Hair-dressers travelled post to Rheims for the ceremony, and were besieged by their fair clients. During the night preceding the coronation, one of them dressed the hair of more than five and twenty ladies, at a charge of forty francs apiece. We must not content ourselves with a mere mention of leg-of-mutton sleeves, they deserve a longer notice, by reason of their own long and absolute reign. Leg-of-mutton sleeves first appeared in 1820, and attained by degrees to such enormous size, that a woman of fashion could not pass through a door of ordinary dimensions. They were kept in shape by whalebones, or by a sort of balloon stuffed with down. Such a sleeve exactly resembled the joint of meat from which it took its name. An extraordinary fashion, indeed! It is hard to understand the “good taste” that presided at its invention. And yet the whole dress of woman soon became centred, as it were, in the leg-of-mutton sleeve. There could be nothing to harmonize in the rest of a costume, with sleeves that preponderated as much as the paniers of old, and the steel crinolines of twenty five years ago. We can but laugh when we examine some portraits of the period. There were some slight changes in the fashions in the reign of Charles X., from 1824 to 1830, attributable generally to incidents of the day, or to popular plays or novels. Bonnets with large hollow brims, feathers and ribbons, Sultana turbans, “berets,” and caps of Chantilly blond, were still worn. Numbers of fashionable women wore a “sentiment” round their throats, or a “carcan necklace” of velvet, or bows either of fur or curled feathers. Gowns barely reached to the ankles; they were trimmed with gauze, blond, bows of ribbon, bands of velvet, twists of satin; feather-fringe and ornaments were sewn on to the material. The short skirts of 1828 caused the boots we had copied from the English to be appreciated; they were both comfortable and sightly. 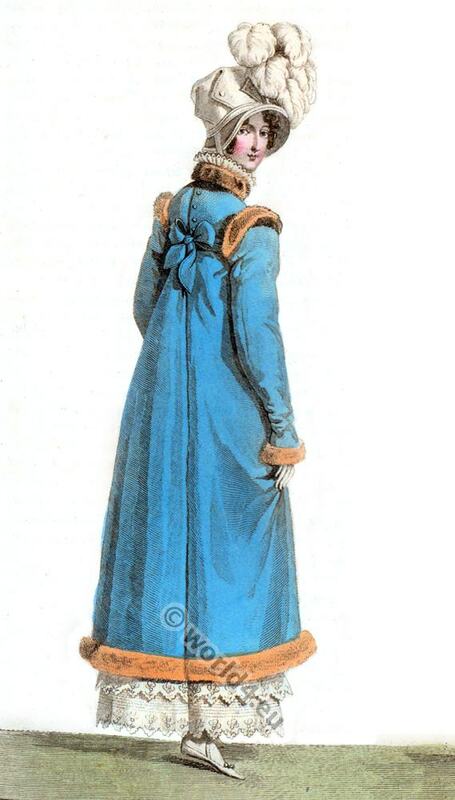 Velvet “toques” were in favour; likewise velvet “witchouras,” chinchilla muffs, bodices draped “à la Sévigné;” satin bonnets trimmed with marabouts, satin pelisses lined with swans’-down; satin gowns covered with crape, trimmed with puffings of the same, roses and pearl wheat-ears, invented by Mme. Hippolyte merino gowns trimmed with satin, Moabitish turbans in crape lisse with gold stripes and a plume of feathers, and, lastly, scarfs in barege-cashmere. The hair was arranged in plaits, or high, stiff curls, on the top of the head, mixed with ribbons and flowers, or with curled feathers “invented by M. Plaisir,” or a steel comb. To these we may add sashes of China crape and gauze, belts of hair, morocco leather baskets, diamond waist-buckles, morocco bags shaped like pocket-books or shells, stamped leather bags, lace mantillas, plaid and damask satin parasols, and terry velvet over-shoes lined with fur. In 1827, France possessed for the first time a living giraffe. The animal had been sent to Charles X. by the Pacha of Egypt, and was placed in the Jardin des Plantes. The giraffe became extraordinarily popular. Never before had the Jardin des Plantes attracted so many visitors; crowds of sight-seers rushed to see it eat or walk about, and for several months it engrossed the whole attention of the public. Chapeau de paille de riz garni de biais formés par des rubans cousus. Robe de cot-pali garnie de biaus dentéls. Pélerine de tulle. Ceinture à la girafe. Gants de batiste. Costumes Parisiens 1827. Our task would be a long and tedious one were we to attempt to describe the costume of the lemonade-seller during the Restoration, that of the jeweller’s or goldsmith’s assistant, of the “lingère,” the florist, the confectioner, &c., in a word, of all the “bourgeoises” whose station was behind a counter or at the bookkeeper’s desk. Each of these adopted a costume appropriate to her business. The wonderful costume of the lemonade-seller of the Palais Royal excited the admiring envy of the ladies of the court, and as for the “cafetière” of the “Mille-Colonnes,” a fashionable hair-dresser expended all his art in her service, just as if he had been devoting his “genius” to the head of an illustrious princess. The Duchesse de Berry would fain have been a leader of fashion during the Restoration, but she never succeeded in the attempt.